In the more than 20 years that I have been a professor at Georgetown University, I have been involved in many faculty searches. Every one begins with a strong exhortation from the administration to recruit more women and minority professors. Yet, in my experience, no search committee has ever been instructed to increase political or ideological diversity. On the contrary, I have been involved in searches in which the chairman of the selection committee stated that no libertarian candidates would be considered. Or the description of the position was changed when the best résumés appeared to be coming from applicants with right-of-center viewpoints. Predominantly liberal faculties identify merit with positions that are consistent with theirs, see little value in conservative and libertarian scholarship, and perpetuate the left-wing stranglehold on the academy. Only 12% of university faculty identify as politically right of center, and these are mainly professors in schools of engineering and other professional schools. (Even then) in a country fairly evenly divided between Democrats and Republicans, only 13% of law professors identify as Republican. And a recent study …. showed that 96% of social psychologists identify as left of center, 3.7% as centrist/moderate and only 0.03% as right of center. Having a diverse faculty is a genuine value for a university and its students. 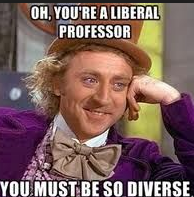 But if diversity is really such an important academic value, then why are universities making no effort to increase the political and ideological diversity of their faculties? My take: Prof. Hasnas’ hammer hit the nail on the head. The entire article — The One Kind of Diversity Colleges Avoid — is worth reading. This entry was posted on April 2, 2019 at 6:59 am and is filed under Uncategorized. You can follow any responses to this entry through the RSS 2.0 feed. You can leave a response, or trackback from your own site. Is it possible that there is a demonstrable majority of graduates from doctoral programs (which is who universities would be recruiting to faculty positions) that are liberal vs. conservative? I’d venture to guess it’s not that diversity isn’t important, but rather the pool of candidates from which to choose is overwhelmingly liberal and therefore the faculty is more representative of the overall population than this article would suggest. That says nothing of the clear inconsistencies in faculty searches, as Hasnas points out, but is the outcome truly skewed, when compared to the population of doctorate-level candidates? To cut to the chase here, are more educated individuals more likely to be liberal than conservative? Also, this article assumes there is inherent value in having conservative faculty. Is there empirical evidence to suggest a more politically-diverse faculty leads to a more robust educational experience? Or any other measurable positive outcome?